From the give me 2 pairs department... 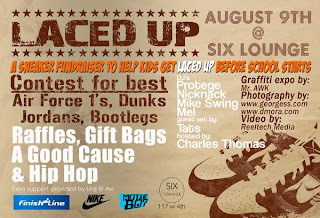 Laced Up... a fundraiser to bring more smelly feets to Austin... @ Six Lounge on Aug 9th with DJs Protege, Nick Nack, Mike Swing, Mel, and Tats. The Air Force 1 athletic shoe, is a product of Nike, Inc.  created by designer Bruce Kilgore. This was the first basketball shoe to use the Nike Air technology. The name is a reference to Air Force One, the plane that carries the President of the United States. The shoes are sold in three different types: the low, the mid-top, and the high-top and come in many different colourways, forms, textures, and patterns. The two most common forms of the Air Force 1's are the all white and, all black pairs. The Mid-Top Air Force 1 is a variation of the shoe and comes with a non-removable strap and a higher top. The Air Force 1 was produced in 1982 and discontinued the following year. It was re-released in 1986 with the modern italic Nike logo with a swoosh on the bottom on the back of the shoe. Little has changed to the Air Force One since its creation in 1982, although the original stitching on the side panels is no longer present in modern versions of the shoe. Since then, over 1,700 color variations have been produced, bringing in an estimated 800 million USD/yr in revenue. The selling of the Air Force Ones online by certain retailers is prohibited by Nike who has restricted supply of the sneaker. Nike Air Force 1s were originally considered the favored shoe of hip-hop artists and basketballers and street players. Rappers Nelly, Murphy Lee, Ali and Kyjuan collaborated on a 2002 single about the shoes. The shoe transcended its status from purely a basketball shoe to becoming "the shoe that can be worn anywhere". The "Air Force 2" shoe introduced in 1987 is a newer variation of the original. The shoe is a typical flat soled, casual-wear sneaker that can be made in many different variations of colors. Also, Air Force 2s were re-released internationally in the early 2000's. They can be made in either the low-cut or high-top style. The shoe can be custom made in any color, but typically it has either a white or black based background color with almost any color used to fill in the Nike Swoosh and back heel.